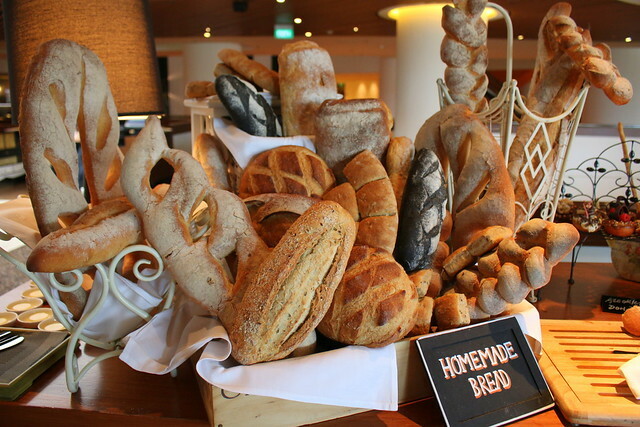 Edge at Pan Pacific Singapore really shines with some of the best buffets in town. The variety is mind-boggling, and the value for money noteworthy given some of the premium ingredients offered. 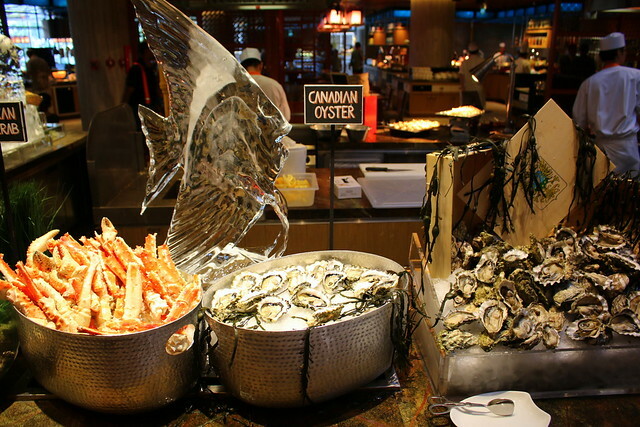 They launched an All-New Theatrical Sunday Champagne Brunch some time ago, with seven live food theatres and 16 stations, and a live band. 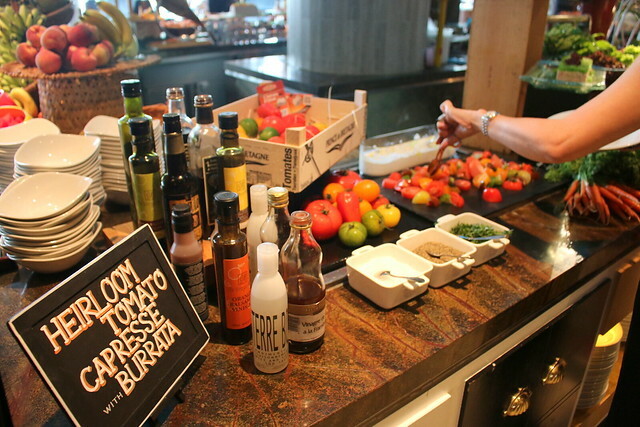 It is also one of the longest Sunday brunches lasting four hours from noon to 4pm. Eat til you really drop! First up, the grill section. Ohmi Wagyu is the star here, along with the prawns. The chefs here know how to cook it to the right doneness. 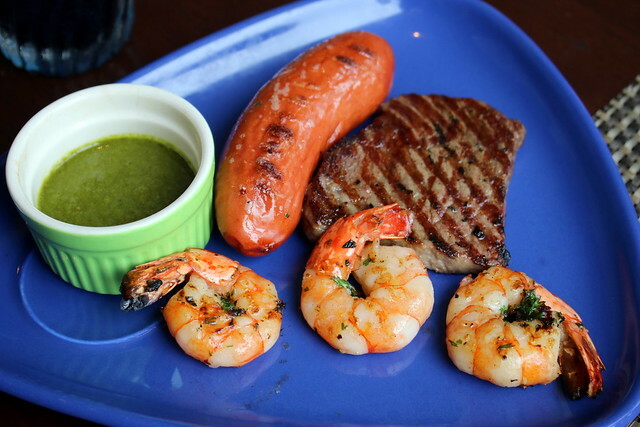 The wagyu is beautifully tender and well-marbled, and the prawns really aromatic. 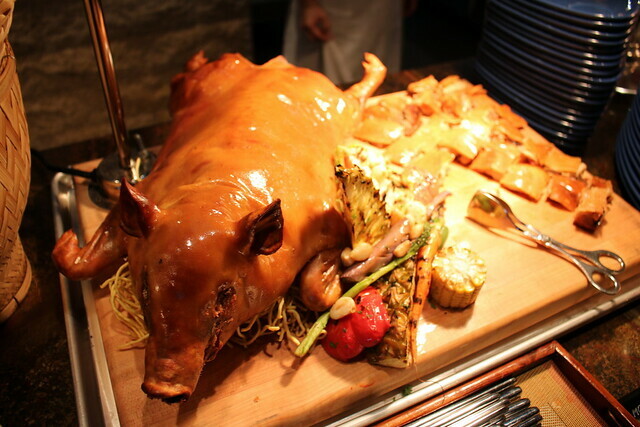 Start your day with Mongolian suckling pig too. Why not? Goes well with champagne. There's also roast chicken and beef prime rib nearby. 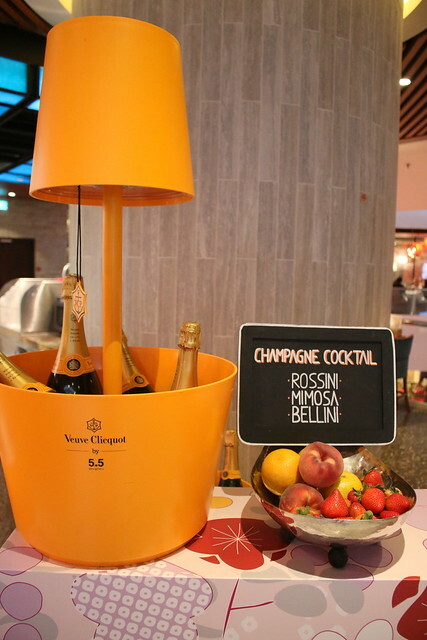 Verve Clicquot is the label served here. You can mix it with your fruit juices or go for a cocktail. 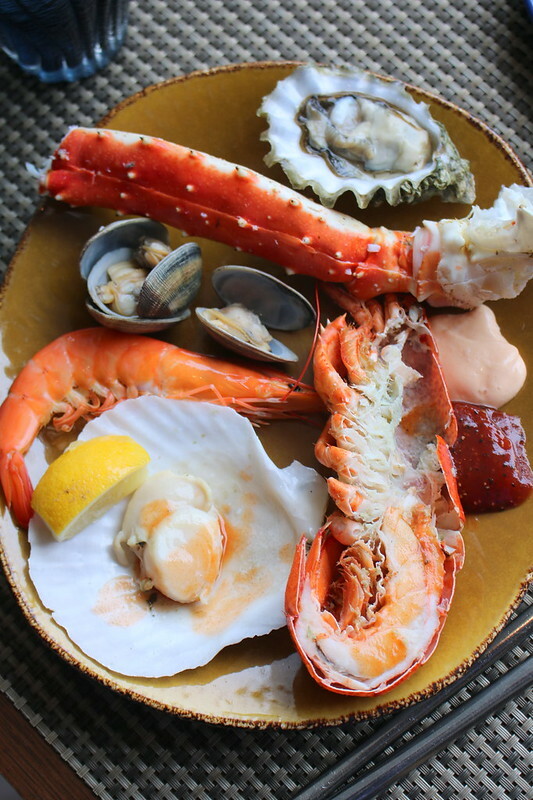 Fresh seafood on ice - oysters, snow crabs, scallops, crayfish, clams, mussels - you name it. 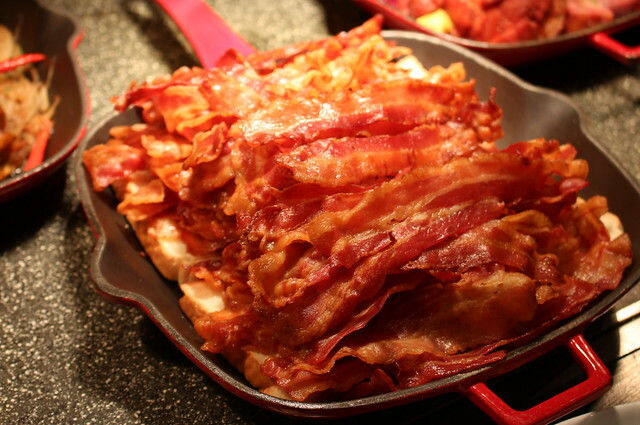 What would brunch be without eggs and bacon? Especially bacon. So you have the usual egg live station, as well crispy bacon galore. 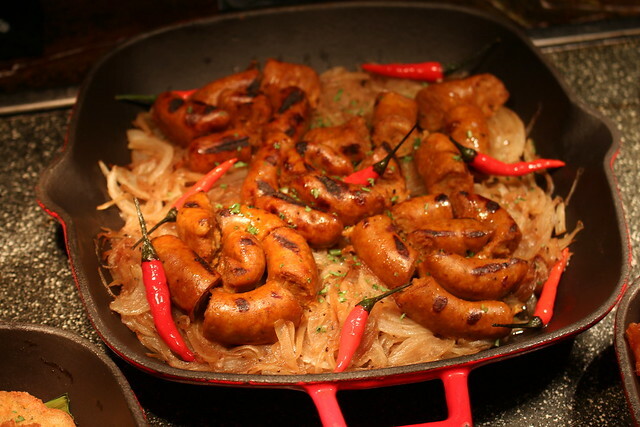 And gorgeous bratwurst and sausages! Pair them with some grilled mushrooms, cherry tomatoes and hash browns. There are also grilled vegetables, and a sinfully creamy mac and cheese. 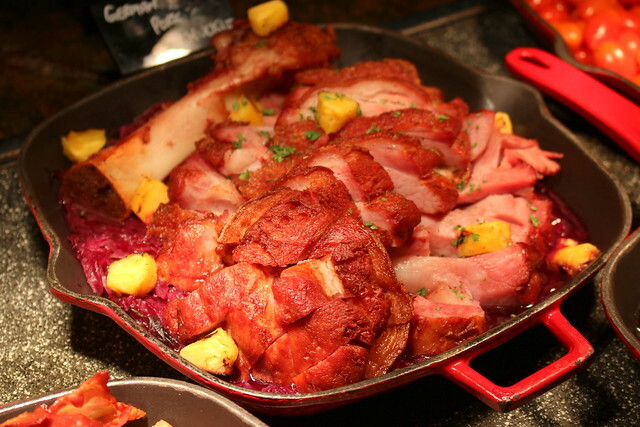 German pork knuckle sounds good for breakfast too! The cheese section is a dream! It's a good variety of soft and hard cheeses. 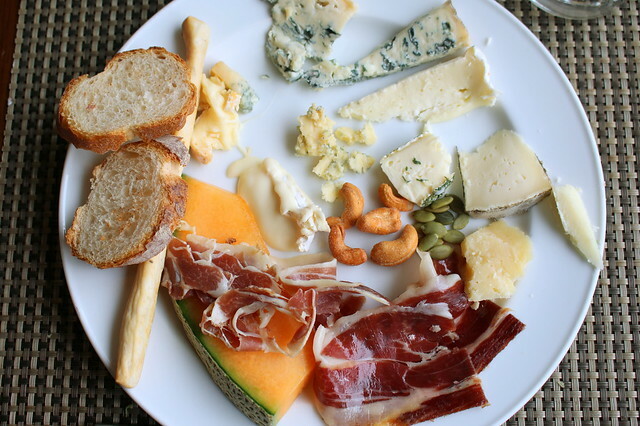 I love trying all sorts of cheeses. Housemade bread to go with the cheeses. 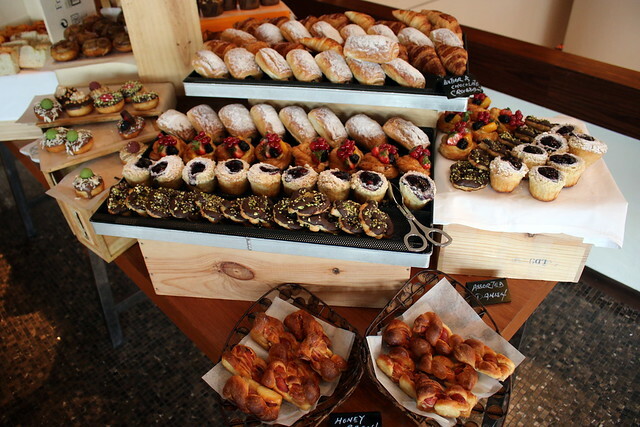 Breakfast pastries for the taking. 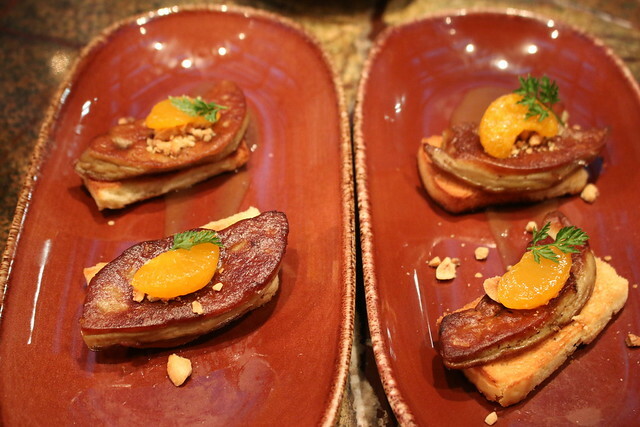 The foie gras station is kept busy with many requests for these delectable treats. 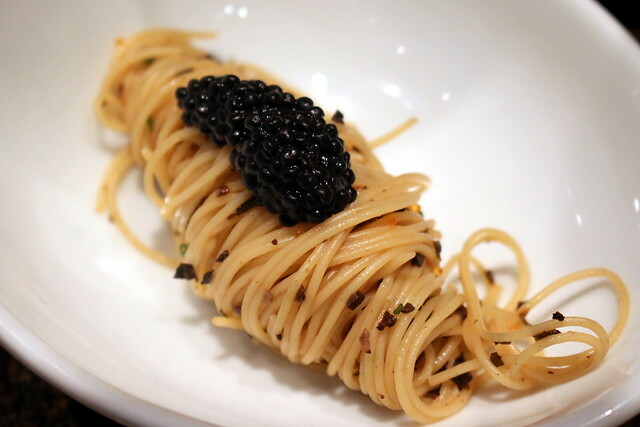 There is a live pasta station as well as little plated pasta dishes like this. Very Les Amis, this one, no? Well, that's where the similarity ends. Stick to the pasta station. They even have Peranakan specialties like Itek Sio, Ayam Buah Keluak, Sambal Sotong, Chap Chye and Babi Pongteh. There's even rice tinged with the signature bunga telang (blue peaflower) dye. Other local dishes on the hot mains section include XO Prawns, Chili Crab and Yu Bak (pork belly braised in soy). 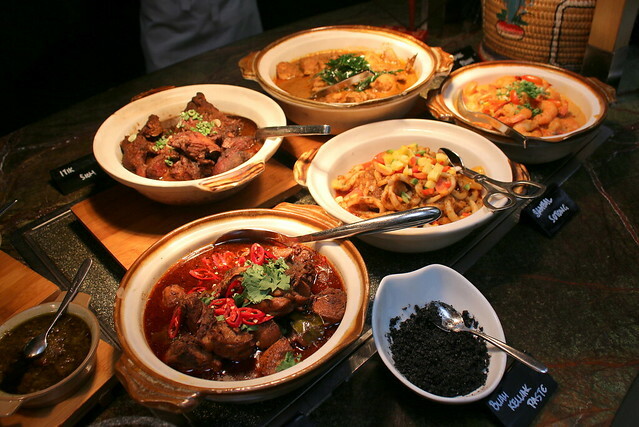 Also seen are Indonesian favourites like Beef Rawan and Sayur Lodeh. 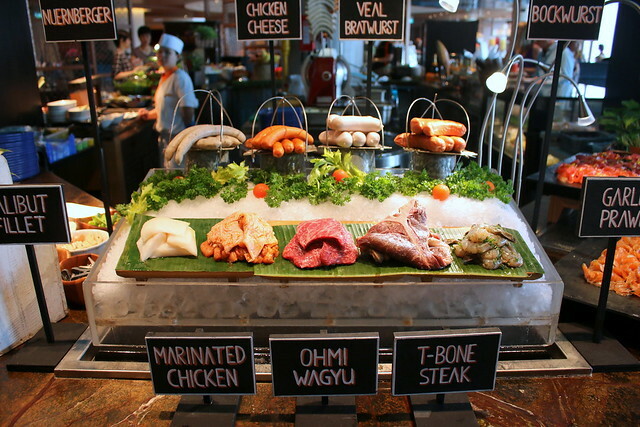 There's a whole section on Malay food too. 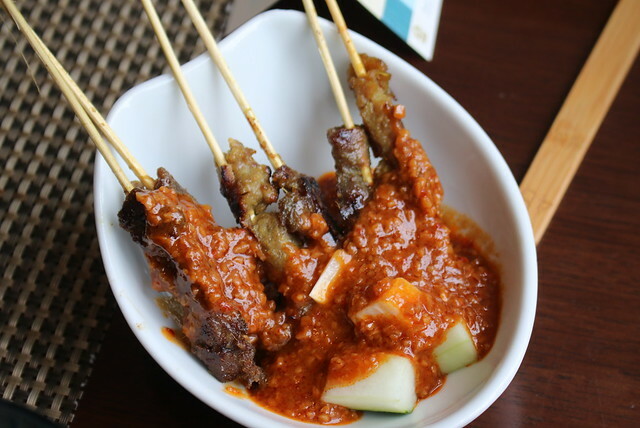 The satay is sedap (yummy). 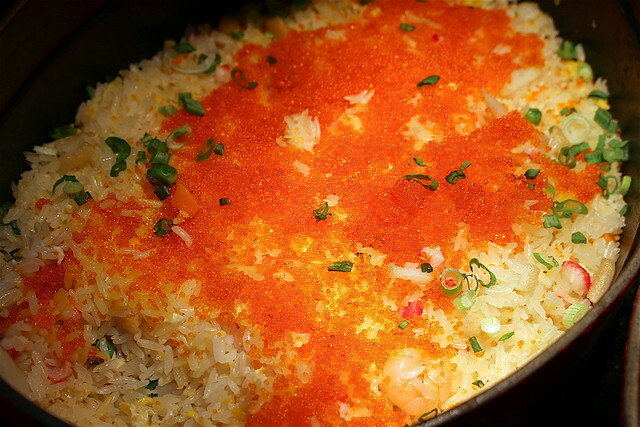 I spied this Fried Rice loaded with tobikko (flying fish roe). I just want to dive in. The Indian section looks pretty good too. 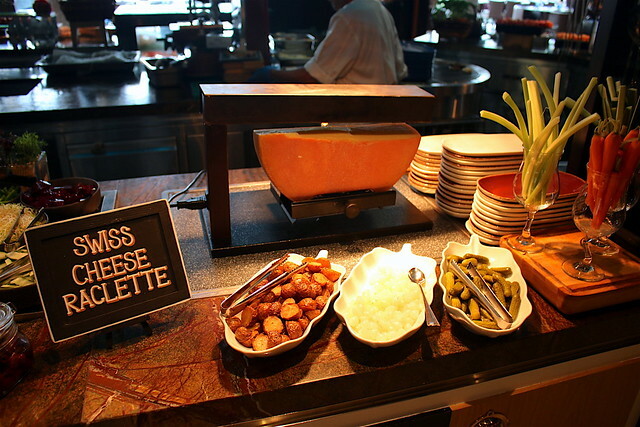 One of our favourite sections, the Swiss Raclette, serves melted cheesy goodness! 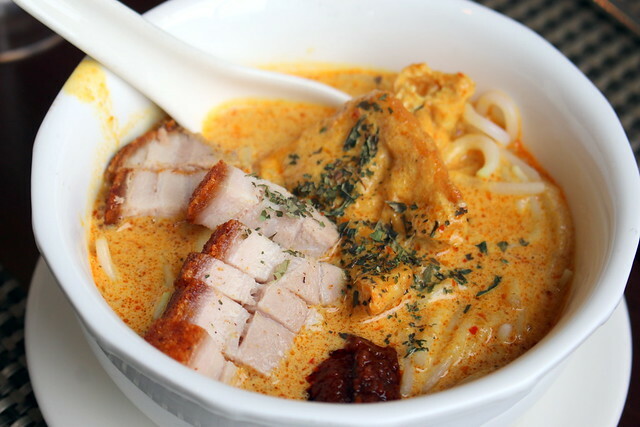 "Zhng" your laksa with some sio bak (roast pork) from the Chinese BBQ section! The noodle station serves good stuff, including a dark KL-style Hokkien mee. 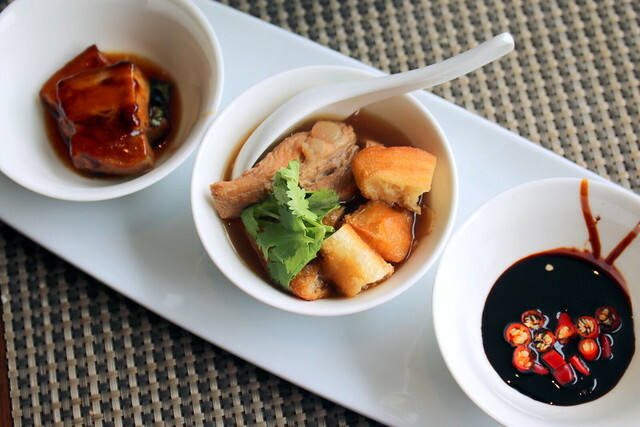 Bak kut teh (pork rib soup) with you tiao and the yu bak (soy-braised pork belly). The Japanese section is pretty extensive. 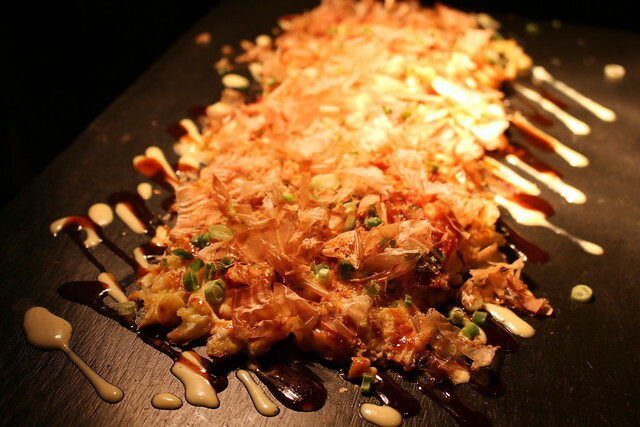 Besides your sushi, sashimi, and tempura, you have Monjyayaki. 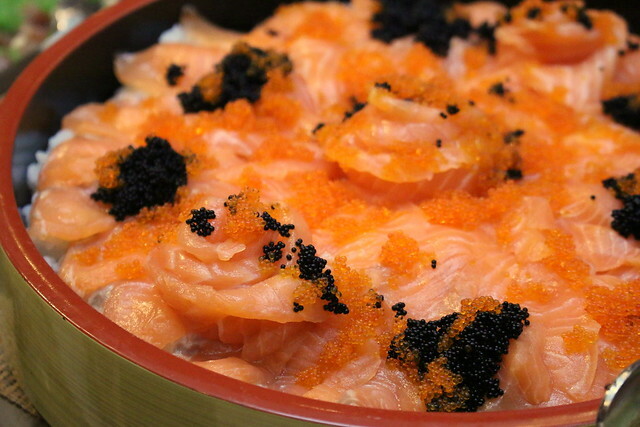 They also have mega chirashi and kaisendon-like bowls. One station is dedicated to heirloom tomatoes! 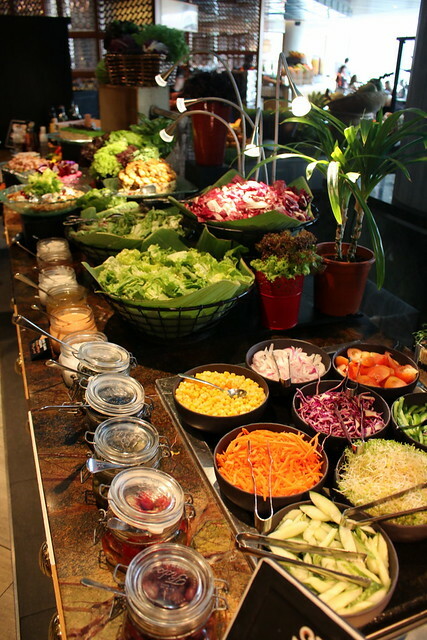 Lots of healthy greens. Everything you need for a balanced diet. 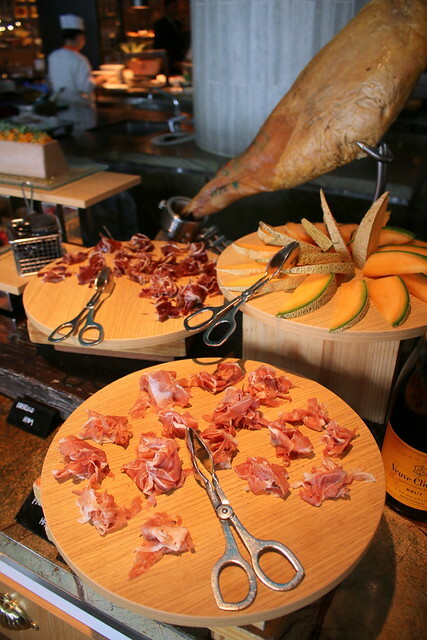 Throw in some Iberico pork and coppa ham! 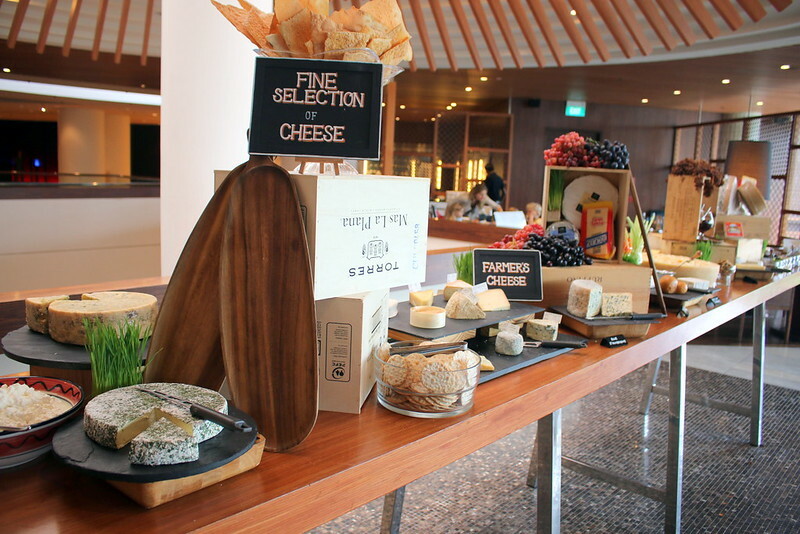 And as if the spread isn't enough, there are roving tables that serve you more yummy stuff. 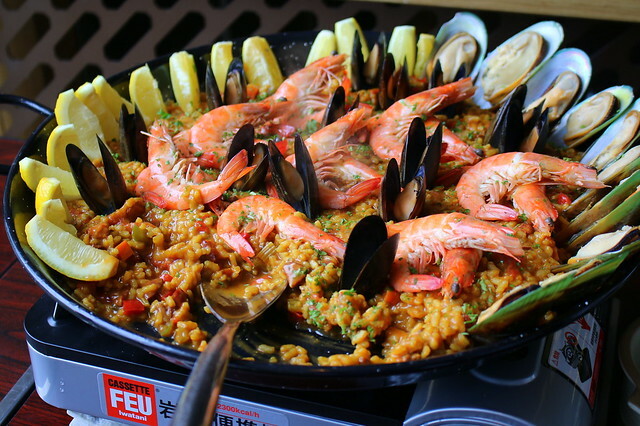 The seafood paella is not to be missed, no matter how full you are. 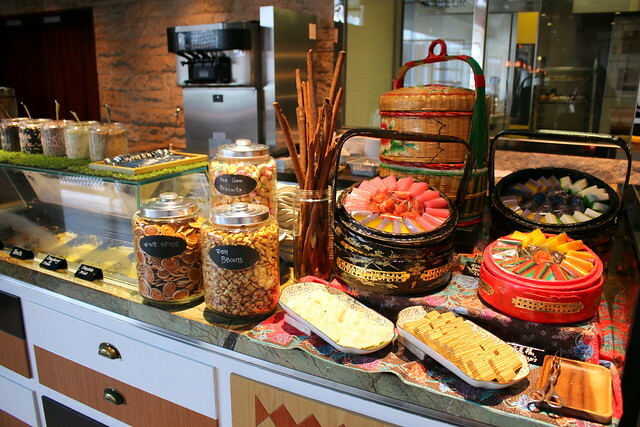 They have such a beautiful array of desserts, with a waffle/pancake/crepe station and an ice-cream counter. All in all, this is a fabulous place to spend an indulgent Sunday. *Includes unlimited selection of red and white wines, selection of international beers, Passion Fruit Mojito, Sugarcane with Rum, Champagne Cocktail, fresh juices and soft drinks. 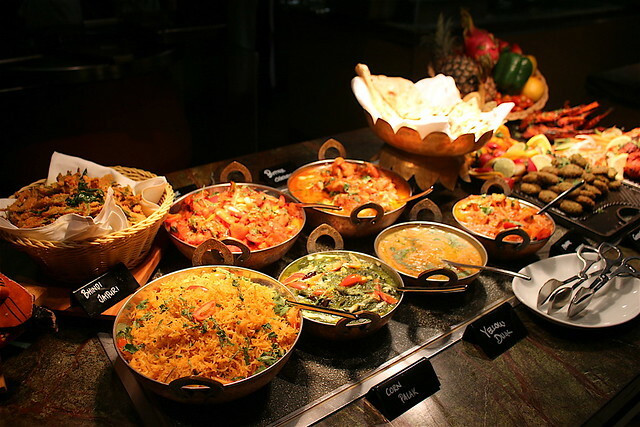 Buffet menu items are on rotation basis and subject to change. Prices are subject to 10% service charge and 7% prevailing government taxes. Please note that prices may vary during festive periods and special occasions.